Did you know this is “Zombie Appreciation Month” ? Spirit Halloween said so. There was a Spirit Halloween store in Columbus last fall, at Polaris. Why is May “Zombie Appreciation Month”? I just saw ‘Sean of the Dead’ a few years ago. It makes the “Zombie thing” more funny. Another relatively recent movie (but I can not remember what it was) introduced me to the concept of zombies. I knew the word “zombie” but never really saw a zombie movie. On a more lively note, it is the first Worthington Farmer’s Market of the summer. The Plant Sale is on the Worthington Green Saturday. There’s mural painting going on in Worthington on Saturday… May is National Preservation month. The Clintonville Farmers’ Market continues, Saturday mornings on High St. There is an event at the Aladdin Shrine Temple, Saturday called the “Celiac Awareness Tour” on Saturday. Learn about gluten free food for those who need it. Worthington Memorial Day Parade… on Memorial Day. Memorial Day Weekend 2012 the Westerville Sunrise Rotary is again doing their Field of Heroes, in Westerville. Photo from 2011 - Field of Heroes. Asian Festival is Memorial Day weekend. Thanks to Kevin Dwinnel for adding the Asian Festival to the ’365 Things to do in Columbus Ohio’ page on Facebook. AsianFest website. The Asian Festival is the 26th and 27th at Franklin Park Conservatory with Dragon Boat races downtown at Genoa Park on May 28th. The BIA Parade of Homes is June 16 to July 1, 2012 in southern Delaware County. …then it’s time for Red, White and Boom again! 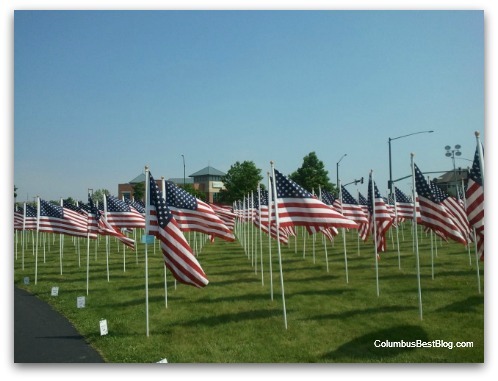 Experience Columbus is always a great place to find out more about events in central Ohio. They’ve go times, addresses, contact information, links to the event.